A case study which explores how one of London’s most iconic buildings has used NFC technology to streamline data key management, security patrol and contractor services into a single interface and deliver more accurate information in real time is now available to download from the NFC World+ Knowledge Centre. 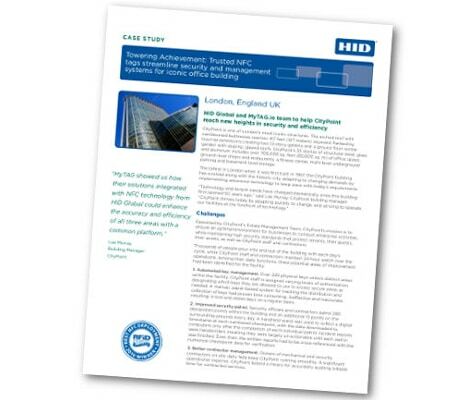 ‘Towering Achievement: Trusted NFC tags streamline security and management systems for iconic office building’ details how HID Global and MyTAG.io deployed a solution across the 35-storey CityPoint building using existing computer infrastructure, standard NFC-enabled devices and NFC readers connected to computers via USB. “CityPoint reports that the NFC and cloud-based solution has reduced the time it takes for individual security patrols due to the increased efficiency of digital tracking versus the previously cumbersome manual recording of checkpoints and incidents,” HID Global says. “Eliminating the paperwork also enables each guard to more effectively observe surroundings. Readers can download this case study free of charge here.